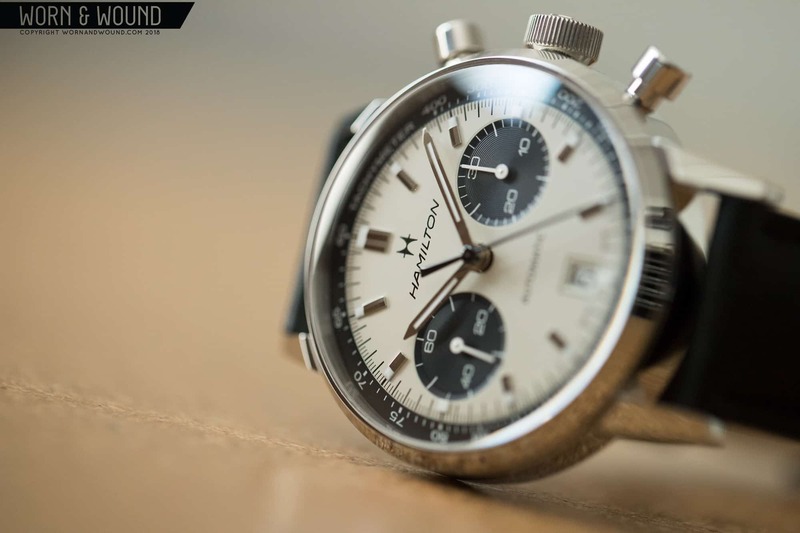 A few weeks back, I wrote about the new Intra-Matic Auto Chrono, Hamilton’s latest neo-vintage release pulling inspiration from two iconic Hamilton watches—the Chronograph A, which Hamilton released in 1968, and the Caliber 11-powered Chrono-matic released a year later. The Auto Chrono is, as noted in that introductory article, a follow up to 2017’s Intra-Matic 68 Chrono, which was a limited edition timepiece that has since long sold out. This time around, the Auto Chrono is a general release model due this coming fall. I’ve already offered some of my initial impressions based on the press materials provided by Hamilton. I recently got the watch in for a hands-on review, so now that I’ve spent some time with it let us take a closer look. According to my calipers, the case measures 40 millimeters wide, 14.6 millimeters thick, and 49.2 millimeters from lug-to-lug. Compared to the 68, the Auto loses two millimeters from its waistline and about one millimeter off the lug-to-lug length. The thickness, however, remains the same. Now, the smaller diameter does wonders for the dial, which I’ll get to below, but the consistent thickness (as to be expected given that both watches share the same caliber) means the watch wears similarly, but for one significant exception. I find that because the case is slightly smaller, it dips better into the flat part of my wrist. As a result, the lugs don’t sit as high as they did on the 68 (though they still sit pretty high), a consequence of the thickness and the case design that I personally was not a fan of on the previous version. Altogether, I find that this watch wears much better than its predecessor did. Your mileage may vary given the shape and inclinations of your wrist, of course. The top-down fit is great on my 7-inch wrist. The smaller case size allows the case back to dip comfortably into the flat part of my wrist . . .
. . . though the lugs still sit a little too high for my liking. Another consequence of the new dimensions, and it’s likely an unintended one, is that the Auto Chrono now better resembles the Chrono-matic. It’s a bit squatter, and it’s that somewhat awkward squatness that gave the case of the original Chrono-matic its charm. Again, your mileage may vary here, too.
. . . that downsizing doesn’t just affect wearability. It also has a significant impact on the design. Ditching two millimeters means that there is less real estate on the dial, so the design elements—all of which were present on the limited edition—have to be rethought. The result? The sub-dials are noticeably scaled down, and consequently the dial feels far more balanced. Not knocking the original—I quite liked the enlarged registers, but I just prefer the equilibrium that Hamilton’s designers achieved here. I also really love the panda coloration with the off-white/cream base dial and black registers (30-minute totalizer at three and running seconds at nine). The dial is ever-so-slightly domed, though it’s hard to tell because the doming occurs at the black tachymeter ring framing the dial. Regardless, it’s a nice, vintage-inspired detail that you can clearer see when you look at the dial off axis. The hour hand domes along with the dial. My one nitpick—and it’s not even a nitpick, but just something that I thought would have been cool to see—is that I wish the date window were white text on a black background. I have always thought that to be one of the coolest design flourishes on the original Chrono-matic, and it would have been great to see it carried through here. As is, it’s perfectly fine, and it’s likely ideal for people who prefer unobtrusive date complications. Powering the watch is Hamilton’s H-31 automatic chronograph caliber, which is based on the Valjoux 7753. The H-31 features 27 jewels, a chronograph function, hacking seconds, hand winding, a date complication, an upped power reserve of 60 hours, and a frequency of 28,800 bph. As I noted above, the date is not advanced via the crown here. Instead, there’s a quick-set pusher at 10 o’clock for changing the date. There’s not a lot of lume on the dial and hands, but what is there does its job well. The Auto Chrono comes on a black leather strap. The strap is acceptable, if not a tad boring. It tapers down from 20 millimeters at the lugs to about 18 millimeters at the buckle. As is, the strap is perfectly fine, but I’d probably try this on some more interesting leathers or on a nylon mil-strap. Overall, I’m pleased with the Intra-Matic Auto Chrono. I think it’s a superior replacement to its predecessor, and Hamilton was smart to make this one a general release. And while I also feel brands could go smaller, and I would love to see what this would look like at 38.5 millimeters, the overall balance here between the case and dial feels much better.